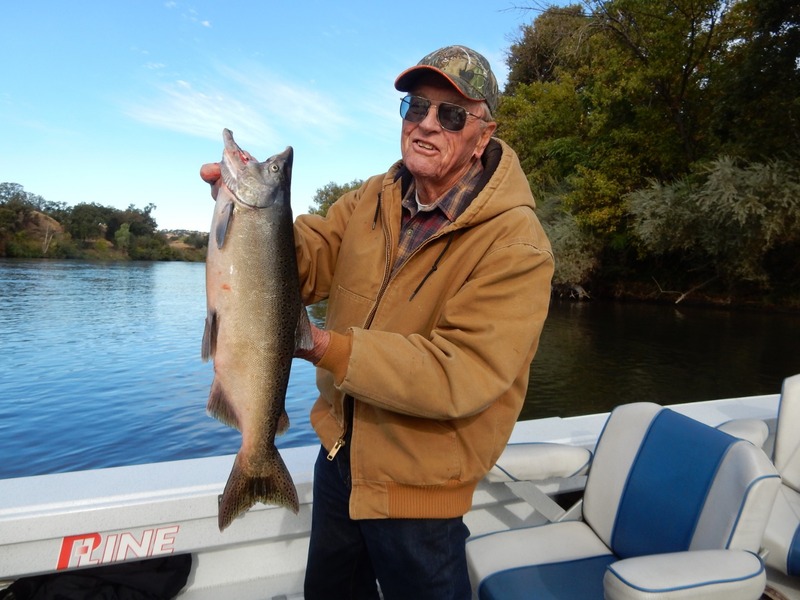 Cal Kellogg, editor of the Fish Sniffer, is happy with the salmon he caught last Friday on the Sacramento River below Ball’s Ferry. 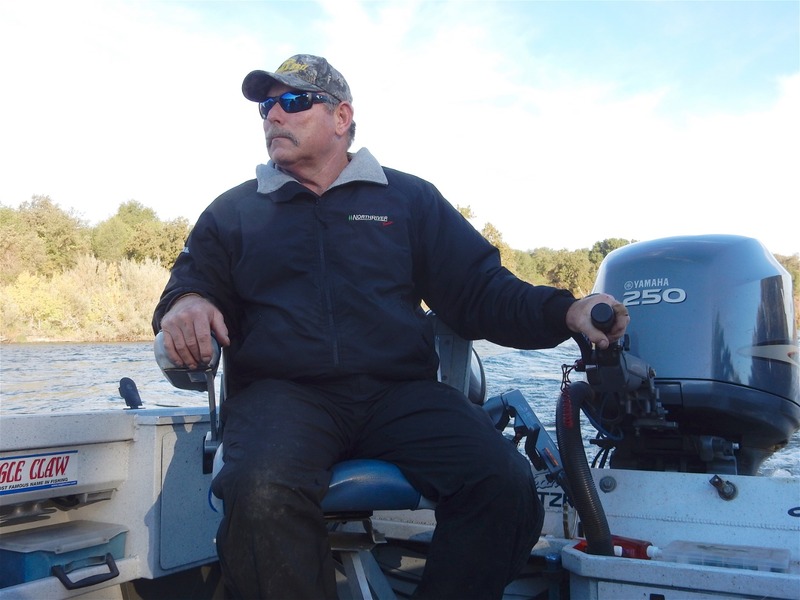 Last Friday, thanks to my pal Mike Bogue, a chap who has been guiding anglers full time on the Sacramento River for 27 years, I got the chance to ride along on a king salmon fishing expedition. With us was Cal Kellogg, another friend and the editor of the Fish Sniffer news magazine. Our goal was to catch a salmon or two so Kellogg could fill some space in the Sniffer with up-to-date info on the current situation. Mike told us that the fishing had been very good up to that point and we hoped to prove him right. We launched Bogue’s 23-foot North River Scout at the Ball’s Ferry launch ramp in Anderson around 6:30 a.m. There were several boats ahead of us and all of them, it seemed, were heading for the same place downstream—namely the famous Barge Hole. It’s a place where the salmon linger before continuing on to spawning areas in tributaries such as Battle Creek which is right there, and others. 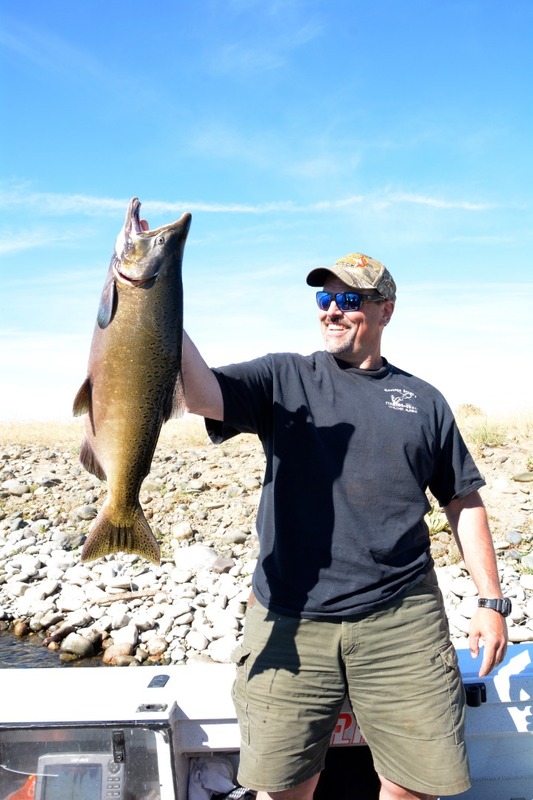 Recently, the salmon fishing has been very good on the Sacramento. Bogue fished the day before we went and his clients caught their one fish limits before 9 a.m. However, even during the best times there are lulls in the action. The fish are sensitive to changes in the water flow, temperature and clarity. It so happened that the river went from clear to cloudy the previous afternoon thanks, we guessed, to run-off from thunder storms over the recent Carr Fire burn area. The fish were turned off, at least temporarily, and while we were fishing at the Barge Hole no one, so far as we could tell, hooked one. We made the drift through the Barge Hole three times without a touch and that’s when Bogue instructed us to reel in our lines. A move was in order, so we zipped our jackets against the still chilly air, and scurried downstream to one of the lesser known salmon hang outs. Presently, our T-55 Flatfish, with fillets of sardines tied on with thread, were wobbling, we hoped enticingly, just off the bottom in that run. To keep them deep enough there were round lead weights on droppers a few feet up the line from the lures. The idea was to lift the weight with the rod repeatedly and allow the lure to move a foot or two downstream each time. Things were very quiet until Kellogg’s lure proved irresistible to a bottom hugging king. His rod jerked one way, he jerked the other and it was fish on—but only for a few seconds. As quick as the fish was on it was off and it was back to square one. I can’t say for sure but I think the editor uttered a discouraging word. We moved one more time and that’s when things finally picked up. As we fished, a few salmon broke the surface so we knew the fish were there. It took a while, but Bogue’s Flatfish drew a hard strike and a quick let go. Shortly thereafter, I hooked and landed a jack salmon. Jacks are precocious males that make their spawning run a year too soon. A short time later, Kellogg caught a bigger jack and that filled out our limits. Before noon we were back at Ball’s Ferry. It was a slow day due to stained water, but we were all smiles after spending a few hours on the Sacramento. I realized, again, that when it comes to river salmon fishing, the Sacramento is a resource that is hard, if not impossible, to beat. The salmon season does not end until December 16, so there’s still time to book a trip this year. To get in touch with Mike Bogue call (530) 246-8457 or check his site: mike@mikebogue.com. Here Mike Bogue steers his North River boat downriver to another salmon hideout. Despite the cloudy water from recent thunderstorms , and the slow fishing that resulted, we caught our limits of king salmon below Ball’s Ferry before noon last Friday. 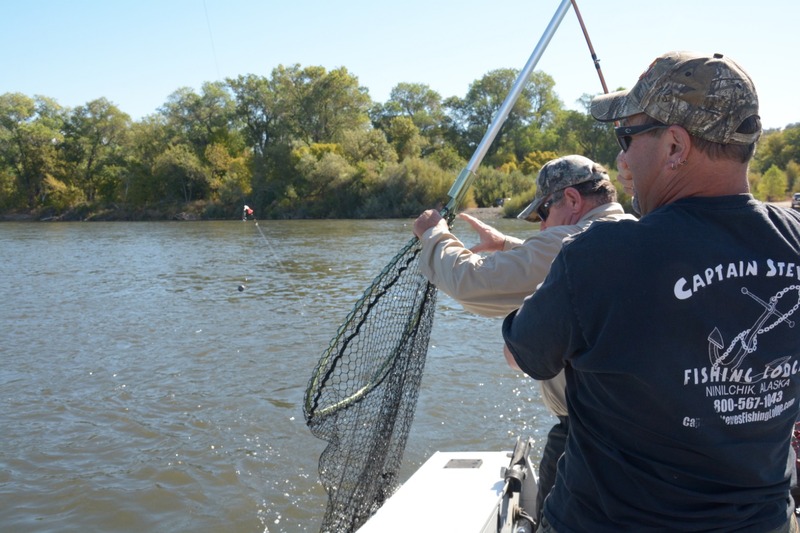 Here Bogue nets the fish that was caught by Cal Kellogg. Author Higley’s day was complete when he landed this jack salmon during his ride along with guide Mike Bogue. Photo courtesy of John Higley. Water, rain, do we need it?